Allie was so nice to give me a pack of these GF/CF English muffins from Trader Joe's and I'm SO glad she did because I LOVE them! They are so good, it is really hard to tell that they're gluten-free. They have a very mild, English muffin flavor. The texture is soft and a little crumbly, the only true tell-tale sign that these are not the "real" thing. Otherwise they're perfect. I don't get to Trader Joe's very often but I'd make the trip for these. 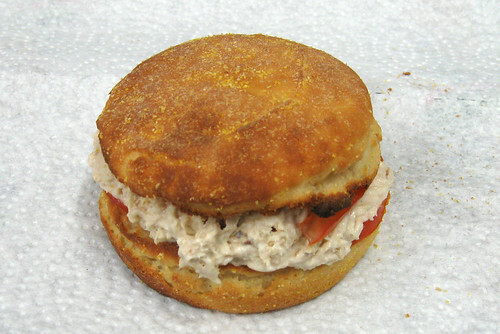 Most people eat English muffins for breakfast, I am a fan of them for lunch, filled with tuna and topped with tomato. So yummy. I'm creating a new habit at lunch time. My entire life, I've eaten sandwiches with a side of something crunchy, potato chips, tortilla chips, crackers, etc. I'm trying to break that habit. Eat just the sandwich and then finish off with a piece of fruit or veggies. I would like to cut out as many non-nutritional foods as possible. I mean not completely, that's just a setup for failure, but yesterday I ate my sandwich without chips and today I did the same. They say it takes 21 days to make or break a habit, let's see if I can do it! Now I'm going to have a few chocolate covered strawberries for desert... usually the fruit won't be dipped in chocolate, but this week, oh yes it will. that sandwich looks DELISH -- it's making me hungry. were they in the freezer section? i had no idea that these existed! thank you!!! Thanks, Allie, these were delish. i just had my last one this morning. The funny thing is, I never even liked english muffins until I couldn't have them anymore. Typical! The texture of these is too crumbly. Reminds me more of a scone than of an english muffin. Have you tried the Glutino English muffins? More nooks and crannies. I also find that since they are not frozen the TJ's muffins get hard and moldy very quickly.